There has been a lot of pirnette winding here at Vävstuga and we are ready to offer two new Yarn-in-a-Jar flavors: 6/1 Tow Linen and 8/1 Tow Linen. The 6/1 Tow Linen jar also contains pirnettes wound with our 4/1 and 1.5/1 Tow with their respective stats. The shorter tow fibers make a lovely linen yarn that is a bit more rustic in nature than the line linen made from the longer fibers. 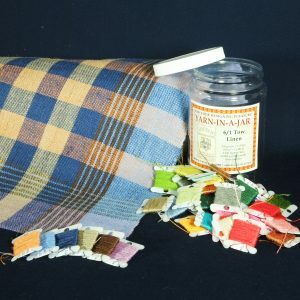 The fibers are long and strong and make a wonderful warp and weft yarn that students in our Swedish Classics class work with in the form of a beautiful little tablecloth. 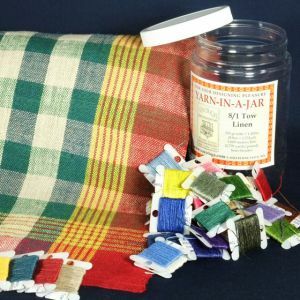 One of many classic uses for tow linen is weft for towels and runners. Our sister organization, Fabric of Life, is offering this special 3-day class, June 2-4, 2018 at the Barn Studio in Shelburne Falls, MA. 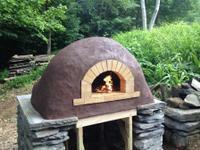 Learn to build your own backyard wood-fired oven out of simple materials from the earth (clay, sand, straw). The instructor, Jon Santiago, is an oven builder based in Haydenville, MA. He first learned oven building while living in Patagonia, Argentina where many people were using wood as their main source of fuel for heating and cooking. More details are available on this printable flyer and on the Fabric of Life website. You may register for this workshop by calling the Vävstuga office at 413-625-8241. The 20th North Quabbin Garlic and Arts Festival will take place September 29-30 2018, 10 am to 5pm, in Orange, MA. They are seeking participants for a “sheep to shawl” type event. They will provide a 10×20 tent, tables and chairs and any other “infrastructure” requested. The festival will pay for materials and would love to have a make your own drop-spindle segment too. For many years the festival has hosted a “local living” area to provide attendees a rich experience of how things work/how things are made at the home and community scale. They haven’t had a fiber focus yet and hope with your help volunteering to get it on the program this year. 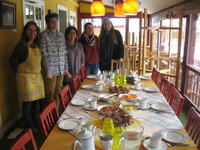 Our very first Artist in Residency Program was completed last Friday in partnership with Fabric of life 501(c)(3) and was, appropriately, celebrated with an afternoon Fika. 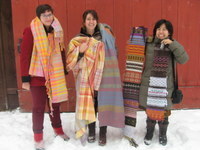 Participants had just finished the 15-week Vävstuga Immersion Program in December where they were able to further develop their weaving skills and gain some independence in designing and planning projects. The three residents wanted a bit more time to explore their own creativity independently while weaving the Vävstuga way. Emily spent 4 weeks, and Kira and Christine each spent 9 weeks, pursuing their own weaving projects at our Farmhouse in great depth. We are extremely proud of their progress, accomplishments, and expect this to be the first of many exciting residencies to be offered. We have been informed that a member of Complex Weavers passed away right before Christmas. The family has sold the home, all that is left is the weaving equipment, which includes a totally equipped 64″ Glimarka Standard with 10 shafts and drawloom attachment for 20 additional shafts. (Loom originally purchased in 1982). The loom is set up and ready to weave. It looks like new. All original instructions are with the loom. Yes, the sale coordinator has been informed about the Glimakra site as a place to advertise this loom, but the family is trying to avoid disassembly and moving costs to a storage facility if at all possible.